Maritimers are famous across Canada for their friendliness and hospitality, but the team at Discover Saint John really takes this well-earned reputation to another level. Their approach to selling Saint John is rooted in bringing business owners, hotel reps and tourism operators from across the city together under one brand to show meeting planners that this bustling little city on the Bay of Fundy is the perfect place for their event to drop anchor. Sales Manager Shawnna Dickie-Garnhum and her extended Discover Saint John team are the dedicated people putting Saint John on the map with their uniquely collaborative sales approach and true Maritime hospitality. They’re competing against larger cities like Montreal, Toronto and Vancouver, along with the rest of the Atlantic provinces, but also against their neighbors within the province. 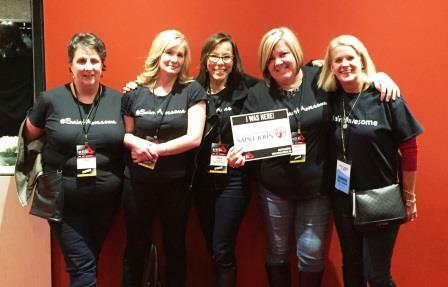 The real game-changer for the Discover Saint John team is their unique approach to selling Saint John. Whether the Discover Saint John team is marketing the city on the floor at a national convention or hosting a FAM tour here in the city, they’re always joined by representatives from uptown Saint John’s two major hotels, the Hilton and the Delta. However, these hotel reps aren’t wearing their individual corporate hotel brands on their lapels– their shirts say Discover Saint John on them. This might strike an outsider as a little odd, but the team at Discover Saint John knows that smaller places have to sell themselves differently, and more collaboratively, than major urban centres do. By presenting a united front, Saint John’s sales representatives can attract bigger organizations without abandoning their ultimate goals: the overall well-being of the city, and the happiness of each client. Even when Discover Saint John attracts, coordinates and holds successful events, the relationship with the happy client is just beginning. Follow-ups are a key part of the business, and correspondence can continue for months or even years. Clients have even been nominated for hospitality awards and other honors by the Discover Saint John team. One of the things the Discover Saint John team does better than most is hosting prospective clients on legendary FAM tours. Close your eyes and imagine for a second: A handshake and a hug on the airport runway. Guided excursions to world-class museums and theatres. Encounters with historical figures ‘brought to life’. Shopping and mimosas at trendy boutiques. Peeking through your fingers at churning rapids. Freshly steamed lobsters at the Ale House. A dram of Islay scotch on Canterbury, or a glass of crisp chardonnay on Princess. The satisfied feeling of a day well spent. Sounds pretty incredible, right? The city really comes together as many members of one team, and they’re able to give clients a few days that they’ll never forget. But don’t just take our word for it– Discover Saint John has produced a video of a recent FAM tour to give you a taste of a visit to the city on the Bay. Saint John has proven that if community representatives pull together, the little guys can definitely play with the big boys. Drop Discover Saint John a line if you think #SaintAwesome might be the best place for your next event. Either way, you’re sure to experience some fantastic Maritime hospitality–and get some great swag! For more information, contact Shawnna Dickie-Garnhum, Discover Saint John Sales Manager at 506.658.2990 or at shawnna@discoversaintjohn.com.